With respect to power and authority, He is the chief, and, indeed, the sole Shepherd. The eyes of all His people are upon Him--and His watchful eye is upon and over all His flock. None but an omnipotent and omnipresent Shepherd can relieve all the necessities of all of His people, in all places, in the same moment, and be equally near and attentive to each one! Such is our great Shepherd! He is eminently the good Shepherd also, for He laid down His life for His sheep, and has redeemed them by His own blood. This great and good Shepherd has a flock, whom He loved from eternity, and whom having once loved--He will love them to the end! (John 13:1). He humbled Himself for their sakes, submitted to partake of their nature and their sorrows, and was made in the likeness of sinful flesh. He died for His sheep, "the just for the unjust," to redeem them from the curse of the law, from the guilt and dominion of sin, from the power of Satan--and to bring them to God! They all, by nature, had "gone astray, every one to his own way;" but having thus bought them with His blood, in His own appointed time--He seeks, finds and restores His sheep! By the power of His Word and Spirit, He makes Himself known to their hearts, causes them to hear and understand His voice, and guides them into His fold! They are then under His immediate protection and government. Yet, if Jesus is our Shepherd, as weak and helpless as we are--we may say with David, "The Lord is my Shepherd--I have everything I need! Surely Your goodness and unfailing love will pursue me all the days of my life, and I will live in the house of the Lord forever!" Every sheep has an inheritance reserved for them in heaven, (1 Peter 1:4-5) and they shall be safely kept, while they are sojourners upon earth, for the Shepherd of Israel is their keeper. The Good Shepherd cares for His flock. Not the slightest circumstance in their concerns, escapes His notice. When they are ready to faint, borne down with heavy exercises of mind, wearied with temptations, dry and disconsolate in their hearts--He seasonably revives them. Nor are they in affliction without a needs-be for it. All His dispensations towards them are medicinal, designed to correct, or to restrain, or to cure--the maladies of their souls. And they are all adjusted, by His wisdom and tenderness, to what they can bear, and to what their case requires. There are lambs among His flock, and for these He expresses a special tenderness. "He will carry the lambs in His arms, holding them close to His heart." Though they are weaklings, they shall not be left behind. If a poor lamb is weary, and unable to keep up with the flock, He shall carry it. These are new converts in the Lord's family--they are, as yet, weak, unsettled and inexperienced. Almost every day brings them into a new and untried situation. They often meet with opposition and discouragement. What would become of them in such circumstances, if their faithful Shepherd had not promised that "He will carry the lambs in His arms, holding them close to His heart!" Such uplifting words and a great way to start my day! 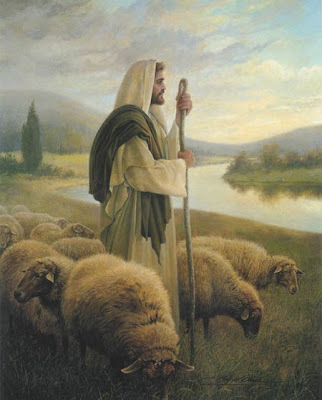 Just love this picture you found of the Good Shepherd. How incredibly blessed we are that He cares for and calls to us!